With more than 400 bridges, it’s no wonder Pittsburgh is called the City of Bridges. Because of the city center’s topography—surrounded by rivers—bridges are a necessary way to connect neighborhoods and to navigate the city. They’ve also become an iconic part of the city’s skyline. In fact, Pittsburgh has even more bridges than the city of Venice. Three bridges, in particular, are beloved by locals. Together, they’re called the Three Sisters Bridges, and they span the Allegheny River between downtown and the North Side. The trio of bridges is named after famous Pittsburghers—an athlete, an artist, and an environmentalist. The Sixth Street Bridge, called the Roberto Clemente Bridge, is nearest to the Point and PNC Park. Next is the Seventh Street Bridge, called the Andy Warhol bridge, which runs near the Andy Warhol Museum. The Ninth Street Bridge, called the Rachel Carson Bridge, runs the nearest to her Springdale hometown. The bridges were built between 1924 and 1928. The bridges are the only trio of nearly identical bridges in the United States, according to records from the Library of Congress. They are also the first self-anchored suspension spans in the nation. “The bridges' design was a creative response to the political, commercial, and aesthetic concerns of Pittsburgh in the 1920s,” according to Library of Congress documents. Today, the bridges are used often for pedestrian traffic as well as automobile traffic. On Pirates game days, the Clemente Bridge is closed to vehicle traffic, giving pedestrians extra space to travel to and from the game at PNC Park. In spring 2015, bike lanes were added to the Clemente Bridge. The bike lanes feature a bicyclist wearing a Pirates baseball cap and a No. 21 jersey (Roberto Clemente’s number). The Clemente Bridge has also recently become the site of “love locks,” padlocks couples affix to bridges as a public show of their love. 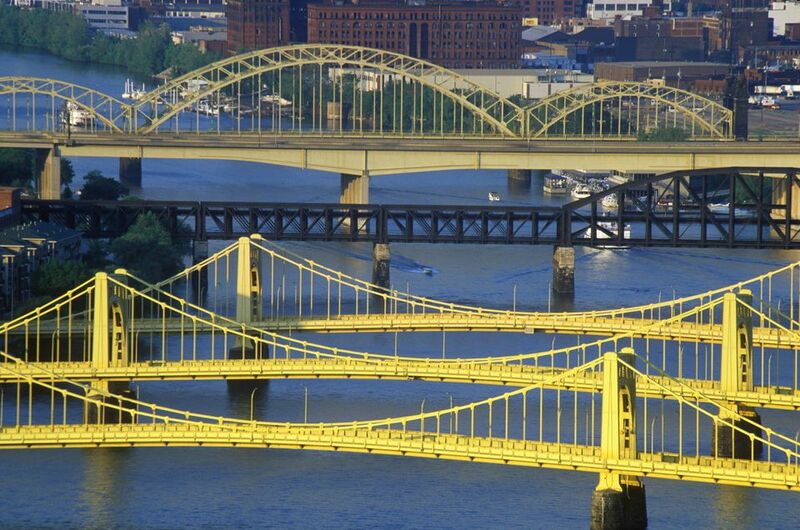 The three bridges are painted with the same iconic yellow color—a shade referred to as “Aztec gold” or “Pittsburgh yellow." Allegheny County rehabilitated all three bridges in 2015, including repainting each bridge. A survey on the county’s website allowed residents to choose among a few options: Keep the bridges yellow; paint the Warhol bridge silver/gray and the Carson Bridge green; no matter the color, keep them all the same; why limit voters to these colors?